I was first introduced to the Firesign Theatre when I transferred to UCLA in 1968 and a dorm mate insisted that I listen to his copy of their first album, Waiting For The Electrician Or Someone Like Him. I had never heard anything like it in my (admittedly then short) life, but I immediately recognized them as speaking a language that resonated with me like nothing I had yet encountered. I bought every one of their iconic albums: How Can You Be in Two Places at Once When You're Not Anywhere at All, Don't Crush That Dwarf Hand Me the Pliers, I Think We're All Bozos on This Bus, and the rest, and listened to them over and over to the point where I could recite most of them from memory (Dr. Memory, that is). Forty-four years later, I still can't point to any cultural entity that has had as strong an impact on my personal worldview as the Firesigns. In spite of the fact that I could never convince Rocket Girl to listen to them (a profound regret), she knew many of their innumerable catch phrases from my constant insertion of them into conversations over the years. 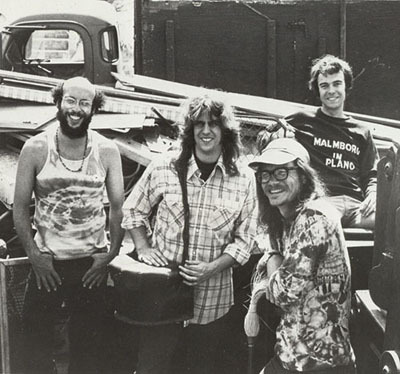 Then, yesterday, Twitter told me that Peter Bergman, one of the founding Firesign members (he's on the far left in the photo above), had died at 72 from "complications of leukemia." In the many tributes that sprung up around the web, it was most common to see people greeting the sad news with one or more of the many Firesign snippets that could be interpreted as appropriate for his departure. As tempting as it is, I'll refrain from succumbing to that particular temptation (apart, I guess, from the post title). In any case, you can read the LA Times obit here.